I rouse myself to check my watch. It’s late. I haven’t seen another person save the blue handed, white cloak laden wardens of the halls for some time. The graduate students, we chosen few, patrol the length of linoleum from office to lab. I shimmy my own blue nitrile gloves down a little further and pull up the stained cuff of my lab coat to see if I have mistaken the watch face. I haven’t. Leaning forward and squinting, I can see the small vial inside of my grandmother’s “cooker” containing a slurry of manganese dioxide and water has begun to fizzle as its boiling temperature is shifted downward. Water molecules consider their life up to this point and decide things are looking better in the great beyond, say goodbye to their friends and family, sever what remaining bonds they have to the liquid state and float into the void of the vacuum. Things are so bad in the vial, it seems, that enough of the little buggers are escaping to keep the pressure in the box from bottoming out. An imaginary leak produced from within: the bane of vacuum experimenters everywhere. I think of the Armstrong limit and making macaroni and cheese on Mount Everest. Using my phone and the cleanest edge of my glove I search the web aimlessly. The Wikipedia page says manganese dioxide was historically used as a pigment. I am literally watching paint dry. Bored with the experiment, I decide to promote the box into the 21st century. As Ron Popeil would say, “set it and forget it”. Forgotten! After a final scrutinizing glance at the little vial, I decide to take an evening stroll around the long abandoned corridors. When I open the door to my lab, air whooshes in from the hall. Another fine example of a mechanically induced pressure gradient, but instead of the little rotary vane pump that is busily gobbling down water molecules from the vacuum oven with its occasional old-man-clearing-his-throat grumbles and burping them into the lab, this one is caused by the fume hood in the back corner of the room. The influx causes my unbuttoned lab coat to unfurl behind me like a cape. A good lab coat imbues the wearer with a certain Fonzerellian swagger. The pop-able collar, the carefully placed stains, the pocket full of scoops and tweezers and balled up kim-wipes and what not. It’s all a carefully orchestrated ensemble. I toss my nitriles into the waste bin and move my safety-glasses to the Doc Brown position. Normally I’d put on a Ratatat album and Gene Kelley up and down the halls, but on this eve I stumble upon the Danger Zone. 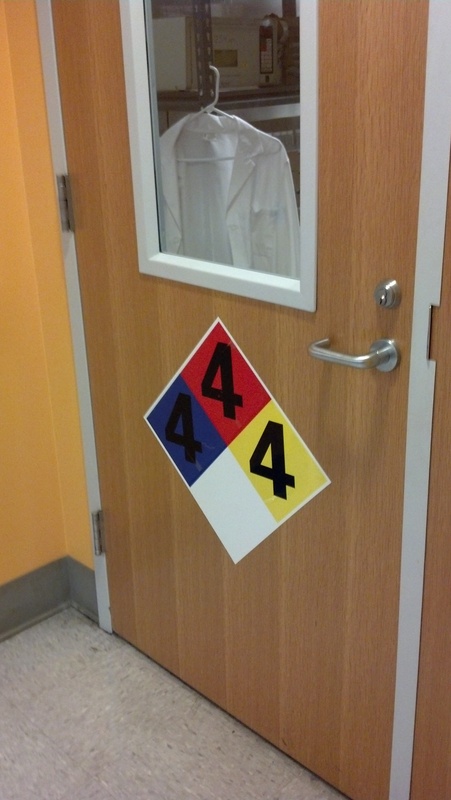 The Danger Zone is indicated by a large, multicolored diamond placard hung on the door of a neighboring lab. This diamond is subdivided into four sub-diamonds – one blue, one red, one yellow and one white. In the top three colored diamonds there stands an ominous number four. I can tell it is ominous because of the deliberate choice to use a bold-faced font. Italics is subtle, bold-face is ominous. Common knowledge. The placard is an NFPA safety diamond with the highest simultaneous ratings I’ve ever seen. The NFPA diamond is the universal indicator for scientists, engineers and common folk alike to tell you the likelihood of imminent liquidation of internal organs. You’ve probably seen one on the sides of chemical trucks on the highway or in your uncle Ned’s doomsday bunker. I’ve been to enough Environmental Health and Safety seminars to know that pretty much only a nuclear holocaust gets a 4 in every category of the NFPA diamond, those categories being health, flammability and reactivity. For comparison, gasoline, which makes such suburban pastimes as the fire melon possible, gets a three for flammability. Yeah. Meanwhile, “very short” exposure to a number 4 health hazard can be fatal and a number 4 reactivity rating is explosive at room temperature with minimal agitation. I have to admit, even swaddled as I am in my lab coat, I begin feeling a little overwhelmed by the idea that a mere 15 feet away from my vial of manganese dioxide (which gets a paltry rating of 1 for health and flammability and 2 for reactivity) are three distinct ways to get sent to the hospital. How do I know there are three? Well, to speak truthfully I don’t, but I would place a wager that no single chemical exists with NFPA ratings of all 4’s that would be allowed within 40 miles of a population center like metro Atlanta. Furthermore, general NFPA labeling like the one on the door to the danger zone indicates the highest combined hazards of all the chemicals found within. I imagine at least two chemicals were needed to propel a lab into the danger zone category. A container of hydrofluoric acid (which will dissolve your bones through your skin) and tri-nitro-tolune (it’s TNT, it’s dynamite) would give you a combined rating of all 4’s. I retreat to the relative safety of my lab and barricade the door. Gordon is pursuing his PhD in Materials Science and Engineering and conducts research on lithium batteries. He likes cooking, textbooks, internet memes and the great outdoors. His viewpoint on science is that everything is more interesting when you understand how it works, also being able to impress (read annoy) your friends with your techno-lingo is a major perk.